I thought for this installment of Gratitude Week, I would start with the quote above from Dietrich Bonhoeffer. The name might be familiar. I featured him a post last year, On Stupidity, that has been pretty popular, consistently getting quite a few views each week. He was the German pastor who spoke out against the Nazi regime throughout the 1930’s, later being sent to a concentration camp before being sent to his death on the gallows in the last days of the war. On Stupidity described the sort of blatant ignorance that led to the rise of the Nazis and seems to exist here today in forms. Bonhoeffer also coined the term Cheap Grace which also seems abundant these days. It’s a post that is worth another look. But the words above from Bonhoeffer offer a different and positive thought, that we receive much more from this life than we ever give in return. Understanding this concept and living with a sense of gratitude gives our lives a richness beyond material wealth. In that vein, I want to point out that there is a political/economic philosophy that has been out there for some time now, one that has led to the increasing disparity of wealth between those at the top and those in the middle and at the bottom. It basically labels people as Makers and Takers. In the eyes of those at the top, the Makers are those who control the wealth and means of production and the Takers are everyone else. They believe that no matter how integral a person might be in assisting the Makers amass their wealth, they are only there to take from them. They see the world as a zero sum scenario where there are only winners and losers. Those at the top are winners and anyone below them are losers. The loser Takers are tools at best to be used in their view. When their usefulness has went away, they are nothing more than dead weight. It’s a distressing idea, one that I would love to say couldn’t exist, but there is ample evidence to support that this belief is flourishing. I would like to offer a counter-thought. In my eyes I see the Makers described above as the real Takers. By doing all they can to gain and gain at the expense of others, they extract joy and compassion from this world, along with dignity,respect, and honor. They take away from the humanity of all people with an extreme selfishness that creates a world of solely winners and losers. But in my worldview anyone can be a Maker because wealth is not the only factor that makes for a better world. Anyone who acts to better people’s lives is a Maker. Those who inspire, those who teach, those who heal, those who put their own lives on the line to rescue those in harm’s way, those who come to the aid of others in need, those who give what little they have until it strains their budgets, those who volunteer, those who work to least the least among us a voice, those who stand up to power so that our air is clean and our food safe, along with so many others—these are the people who make this world a better place, who bring a sense of dignity to all people. These are the true Makers. These are the people who create the richness of this world. Please understand that what you have in this world is the result of being assisted by others. You may be the most fabulous, self-sufficient being in the universe but you have done nothing absolutely on your own. We are the beneficiaries of the work and care of others. Let us acknowledge that and be grateful. Be a Maker. The words above are on a wall at the United States Holocaust Museum. Most of you are most likely aware of them. First They Came… is a poem written by the German Lutheran minister Martin Niemöller in the aftermath of World War II. In the early 1930’s, Niemöller was initially a nationalist— yes, there’s that word again–and strongly supported the rise of Hitler and the Nazi party. But as the Nazis increased their persecution of those they saw as inferior, he began to sour ( even though he still sometimes used anti-Semitic rhetoric in his sermons of that time) on Nazism and eventually began to speak out against their policies. He was arrested in 1937 and spent 1938-1944 in prison camps including Dachau, narrowly escaping execution. In the aftermath of the war Niemöller spoke openly of his regret for his early support of the Nazis and the fact he did little to help their victims in that time. He became an advocate for pacificism and an opponent of nationalism in any form. First They Came… was a poem that he used often in different iterations in his speeches and sermons after the war. Its themes of persecution, irresponsibility and cowardice are pertinent in any time when autocrats seek to take control through scapegoating and division. These themes were employed in a 1951 poem, The Hangman, written by Maurice Ogden. It is a poetic parable about a hangman who enters a small town and erects a gallows. As in Niemöller’s poem, the townspeople stand idly by as he takes their neighbors. They believe because they are somehow different from their neighbors, they will be spared. But, of course, they are not. The Hangman was made into a an acclaimed animated short film in 1964. It is pretty crude when compared to today’s animations. But that crudeness seems to add a sense of menace to the power of this parable. 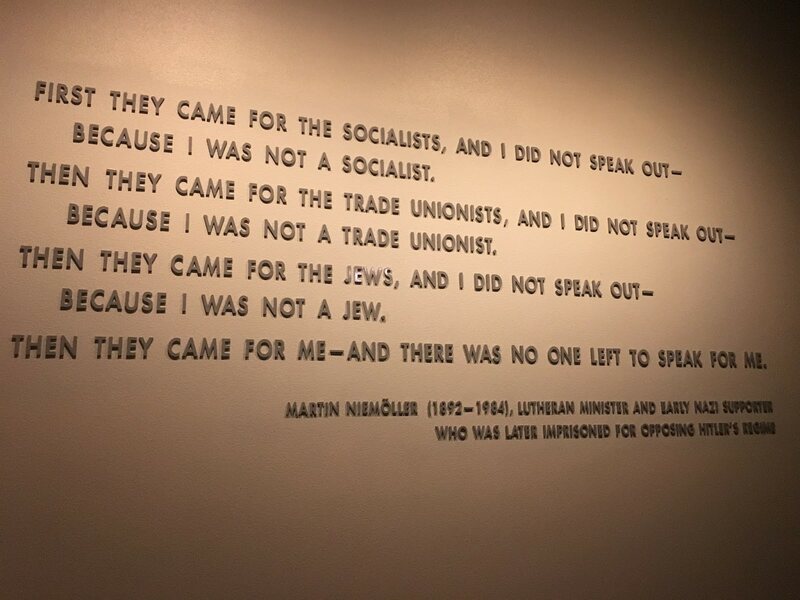 Perhaps you don’t see the parallels between this film or Niemöller’s poem with the events taking place in the world today. Perhaps you not concerned with the huge rise in anti-Semitic here over the past two years, the election of an openly fascist leader in Brazil this week or the widespread surge of nationalism and racially biased hate groups around the globe. Maybe you even think the so-called caravan of death and disease is a real threat, as ridiculous as that whole thing is. Maybe you think that you are safe and secure, hardly a target for hatred or persecution. That is exactly why you should speak up for those who are targeted now. Because when you become the persecuted, who will be left to stand up for you? The cowards that allowed things to get to that point will not suddenly gain the courage to defend you. 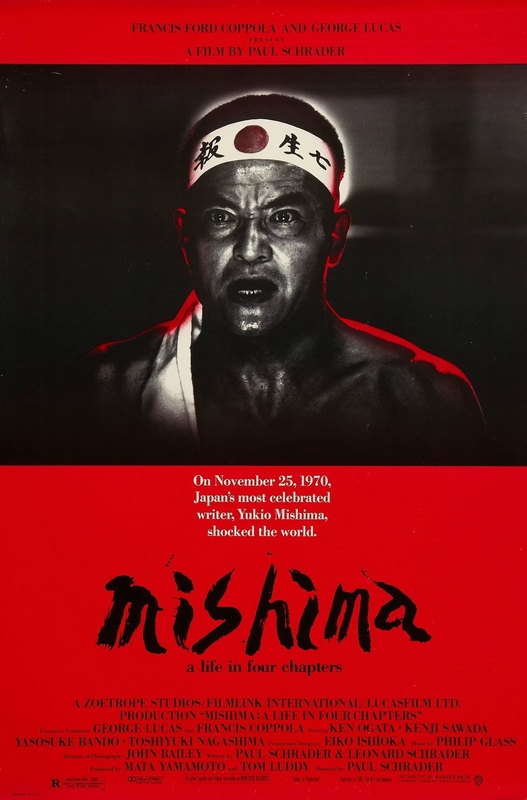 Take a look at the film if you have the time. It’s about eleven minutes in length. You can also read it by clicking here. Speak up. Don’t look the other way. And vote hard. Today, May 1, is May Day. Some folks see it as a festival of spring that began as an ancient pagan celebration, complete with May Poles, May Queens and May Baskets. Others recognize it as a day celebrating laborers, trade unions and the working class, otherwise known as International Workers’ Day. I think that labor unions have been integral to the rise of the American middle class and to many things that we now take for granted. Things like eight hour workdays, weekends, child labor laws, workplace safety, minimum wages, health insurance, paid vacations, retirement pensions and on and on. Things that provide a sense of comfort, security and self-worth for working folks. I believe that the demise of unions goes hand in hand with the growing chasm in income inequality between the owners and the workers of this world. The owners had the shrewdness and the resources to mount a sustained campaign over the years that constantly painted unions in an unflattering light, to the point that many workers began to side with the owners, often against their own self interest. It’s the same kind of thought control that makes workers believe that big tax breaks and other benefits reserved for owners will have a magical trickle down effect and will somehow enrich their own lives. Unfortunately, human nature overrules trickle down economics every time. The benefits that the people in labor unions fought and died for — yes, died for— are soon under attack from owners who need more and more and more. The labor battles will no doubt have to be fought again at some point and lord knows what ugliness will come from that. The painting shown at the top and a favorite of mine, is titled May Day and is in the collection of the Fenimore Art Museum in Cooperstown. I thought it was a fitting image for today. It was painted in 1948 by a favorite artist of mine, American folk artist Ralph Fasanella, who I have written about here a number of times. He was a labor organizer in the 30’s and 40’s when the workers’ movement was making the powerful strides that created the mythic middle class that inhabited the America of the 1950’s. I am not going to spend a lot of time describing his career here but will point out that his work often portrayed labor and workers. It is powerful stuff, to say the least, and pertinent both for its own time and now. 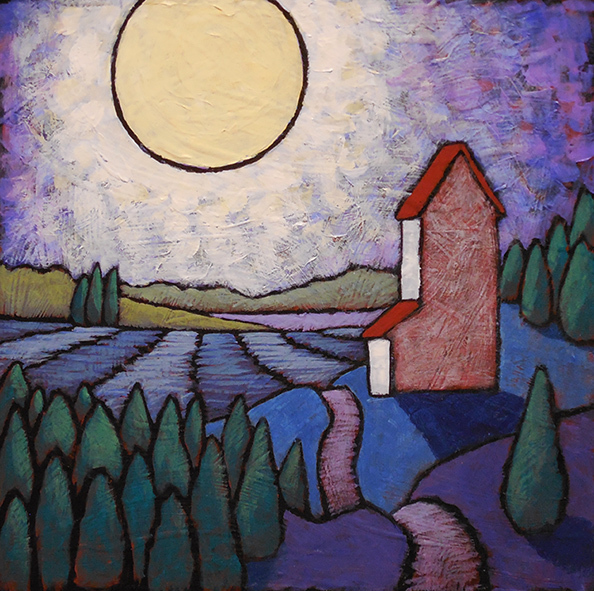 Ralph Fasanella was born in New York City to Italian immigrant parents. He spent his youth helping his father on his ice delivery route, and absorbed the streets, tenements, and people that would later inspire his art. His mother, a literate and socially conscious woman, introduced Fasanella to antifascist and trade union causes. He eventually became a union organizer until he began to paint in 1945. Fasanella was an acclaimed “primitive” painter in the 1940s, and then painted in obscurity for 25 years until his “discovery” in 1972. 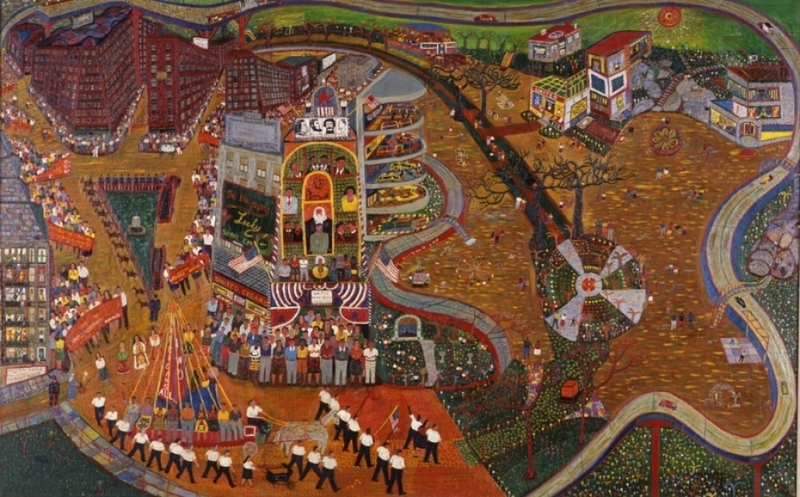 May Day represents Fasanella’s attempt to capture the spirit of the workers’ movements of the 1930s, focusing upon the huge May Day parades that annually drew up to 200,000 demonstrators to Union Square in New York City. At the left, marchers pour out of the crowded streets and tenements and descend upon New York’s Union Square. Their large banners proclaim support for organized labor and racial unity under the overarching cause of “Peace, Democracy, Security.” At the head of the parade is a magnificent horse-drawn float, complete with May Pole and women in ethnic costumes. The marchers pass a reviewing stand with a backdrop that serves as a shrine to labor heroes. Across a colorful bed of flowers lies the artist’s utopian vision at the right. It is a place where workers, liberated from the burden of twelve- and sixteen-hour shifts, have the freedom to pursue cultural and recreational activities. 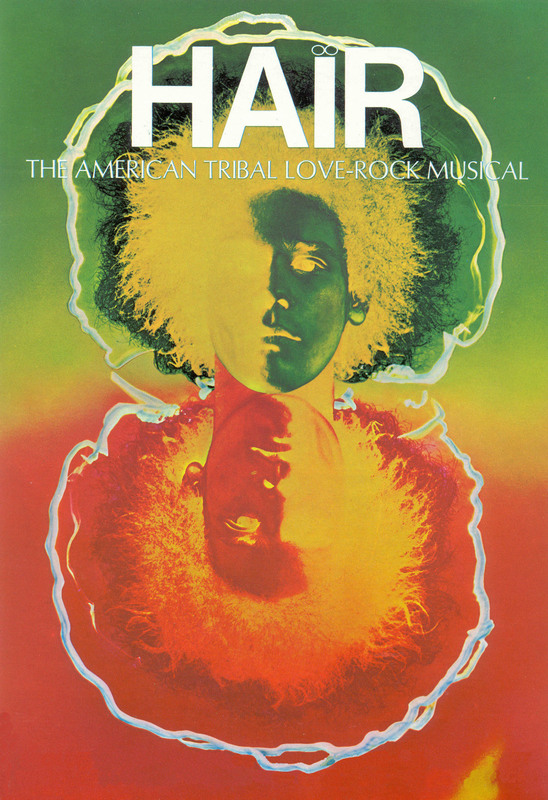 The musical Hair opened on Broadway on this date 50 years ago, back in 1968. I grew up listening to this album and most of the songs feel like they are ingrained somehow in my DNA. Hailed as the American tribal love-rock musical, it was a groundbreaking show with songs that permeated the culture and helped define the era. Aquarius certainly feels like that time and that year. And what a year 1968 was, here and around the world. There were the tragic assassinations of Martin Luther King Jr and Robert F. Kennedy in April and June. In a stormy election season, the 1968 Democratic Convention was an eight-day violent skirmish in the streets of Chicago between police and protesters. Ultimately, Richard Nixon was elected president. Here and around the globe, student anti-war protesters filled the streets and sometimes, as in the cases of Columbia University and Howard University, took over and occupied buildings. North Korea captured the American surveillance ship the USS Pueblo and held its crew prisoner for 11 months. North Korea released the crew but kept the ship. It is now an exhibit Victorious Fatherland Liberation War Museum in Pyongyang. There was the Tet Offensive and the My Lai Massacre in Viet Nam. You had the Prague Spring that results later in the year with the Russians marching into Czechoslovakia to exert their control. Before the opening of the 1968 Mexico Olympics, students protested in the streets that the money spent by the country for the Olympics would be better put to use in much needed social programs. The protesters were surrounded by the army and fired on, killing over 200 students and injuring over 1000 more. The Olympics themselves were memorable with Bob Beamon soaring to an unfathomable record in the long jump. And, of course, there was the iconic image of Tommie Smith and John Carlos on the podium for the medal ceremony for the 200-meter run. Bare-footed with their heads cast downward, both raised gloved fists in the Black Power salute. That would be enough for most years– maybe most decades. But there was even more that I don’t have time to go in here that make it one of the most chaotic and super-charged years in our history. And among all that, the subversive sound of Hair played on. Well, it’s been fifty years and the world seems to have rotated back to find us in a similar time of chaos. Some things never change, I guess. So, for this week’s Sunday morning music I thought something from Hair would be fitting. So many great choices but here are a couple of better known selections, both of which became hits for artists that covered them in the following years. The first is Easy To Be Hard which was hit for Three Dog Night. The second is the title anthem which was #1 hit for The Cowsills. Give a listen and have a good Sunday. I am no longer an artist interested and curious, I am a messenger who will bring back word from the men who are fighting to those who want the war to go on for ever. Feeble, inarticulate, will be my message, but it will have a bitter truth, and may it burn their lousy souls. 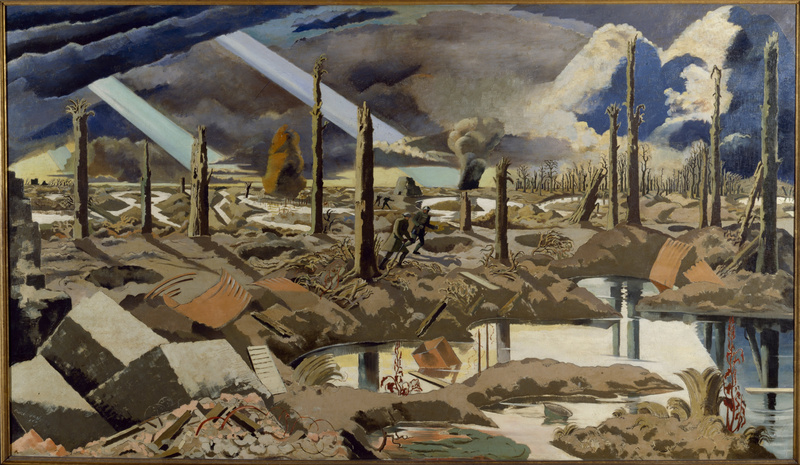 You most likely don’t know the name of British artist Paul Nash. I wasn’t familiar with the name until just recently. He lived from 1889 until 1946 and was a force in bringing Modernism to British painting. But perhaps he is best known for his scenes of war, primarily from WW I. They have a surreal otherworldly quality that creates a sense of disturbing unease. 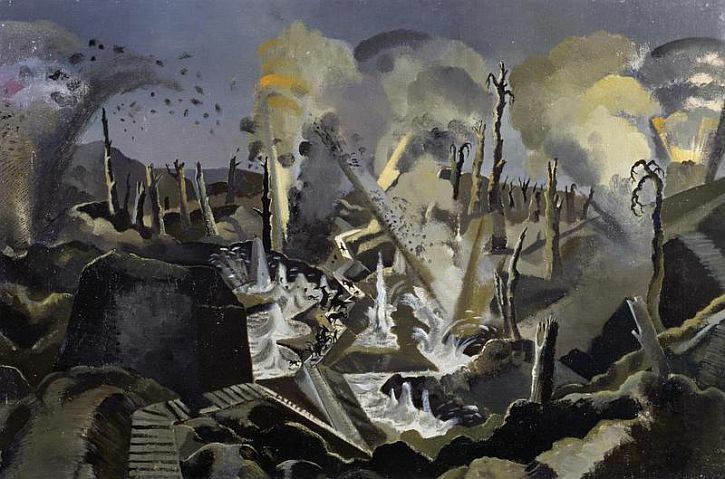 Nash knew the horror of war firsthand, fighting in the British trenches of the Great War. His quote at the top is a powerful indictment of homeland politicians, chicken hawks and war profiteers who go on and on, seemingly unaffected as others die for their words and deeds and bottom lines. The sentiment still rings true today. 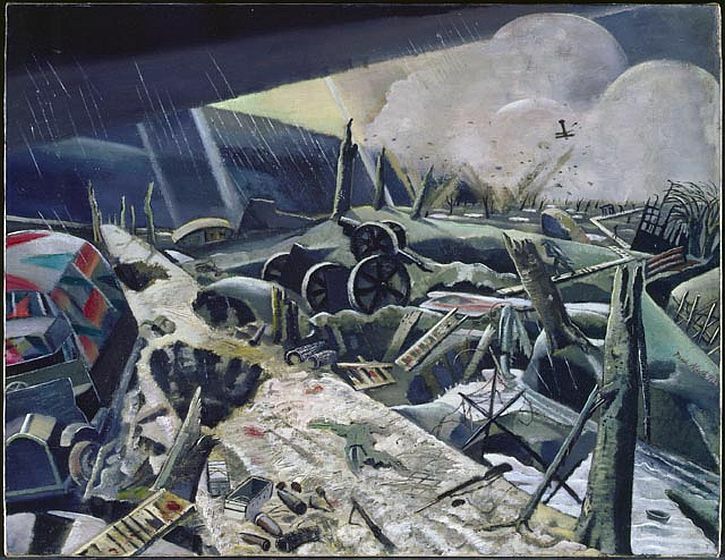 There was a tremendous amount of paintings of the time that depicted the terrible reality of the first World War. It was the first modern war that used technology that was designed to kill the enemy in mass and it left a psychic scar that still hasn’t healed to this day. Nash’s work was among the best of this work. 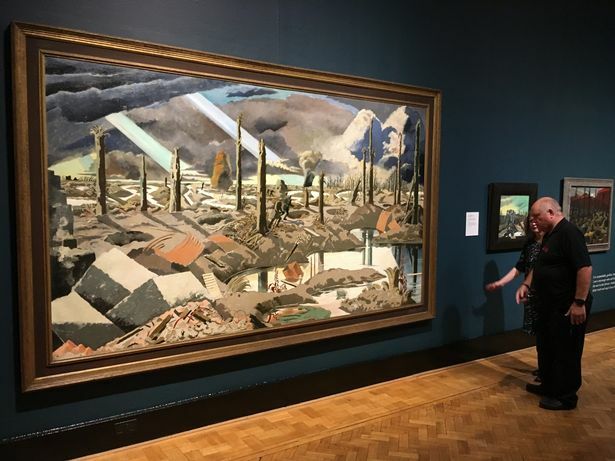 The painting at the top is The Menin Road. It’s a powerful image that is large in scale, as you can see in the photo at the bottom. We’re in the Fourth of July weekend here but I am pretty busy, with still much to do to finish up work on my show, Self Determination, for the West End Gallery that opens in less than two weeks, on July 14. I’m pretty locked in and didn’t even realize until just the other day that the holiday was approaching. I probably will work through the holiday but that doesn’t bother me. It’s my choice, my preference, my freedom to choose to do so. Maybe that’s what the holiday is about, after all. I was reading from David McCullough‘s book, 1776, earlier today. His description of our citizen soldiers at the onset of the American Revolution made me feel closer to that spirit of independence. He described them as unkempt and undisciplined, displaying little or no respect for taking orders from anyone but willing to work tremendously hard toward a goal. I can identify with that. I thought for this Sunday I would share another favorite song, one that contains some good advice for this divided nation on it’s most unifying of holidays. It’s Let’s Work Together from the seminal 60’s blues-boogie band, Canned Heat. Words to heed and a great rolling rhythm to carry you through the holiday. I love this video from 1969 on a German music show of the time, Beat-Club. It’s kind of cheesy with bad angles and an audience that seems like they were instructed to under no circumstances show any reaction to the music. And the band is hardly the most photogenic. But it shows the band in its original glory, with lead sing Bob “Bear” Hite and guitarist Alan “Owl” Wilson, both of who died much too early, Wilson a year later in 1970 and Hite in 1981. Give a look and a listen and have a great day.